Diggers Valley: 10 December 2016. The week beginning the 10th of December 2016. We were invited and went to Kaikohe this afternoon to see the première of Natalie, a short film, with which the lovely Michael Bennett had been involved. (Michael is Stella's best friend Matariki's father.) Matariki was there too and it was lovely to see her. The film was very good and because it was so short, there was time to watch it twice! Jacob and I went walking out to the Spring paddock and spent some time exploring the stream, looking for interesting things. 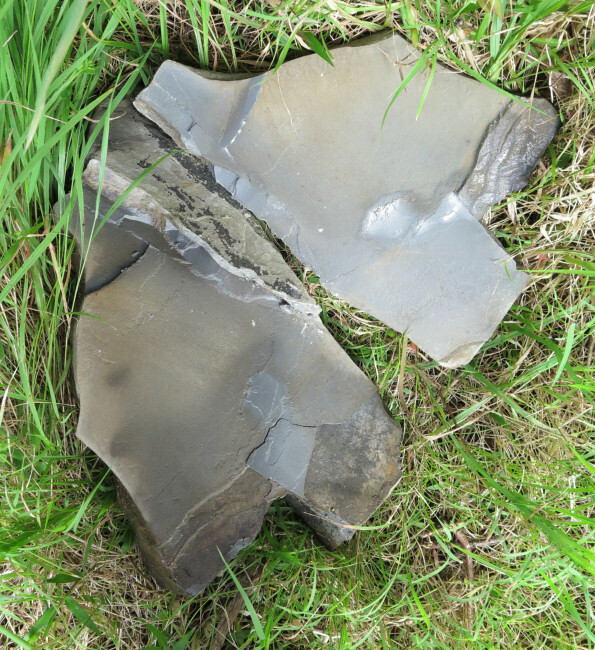 I found this, presumably shale, broken in the water and when I knocked it again against another rock, another layer sheered off. What interesting material. 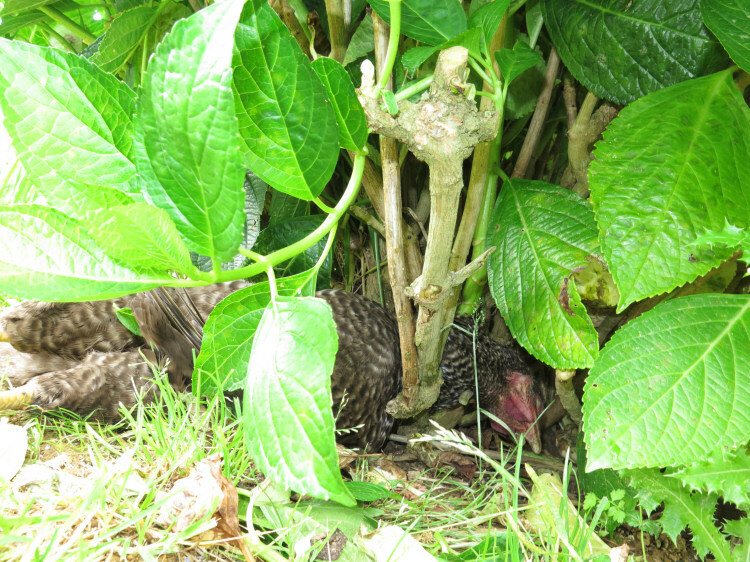 At around 7pm there was a strange noise outside and one of the hens had disappeared. We looked around all over the place but couldn't find her. I was gazing out the kitchen window and spotted something odd, so went to have a closer look and found this, one very dead hen. She had somehow got her head stuck between two low branches of this Hydrangea bush and the noise I heard yesterday evening must have been her last. I can't quite see why this would have happened. 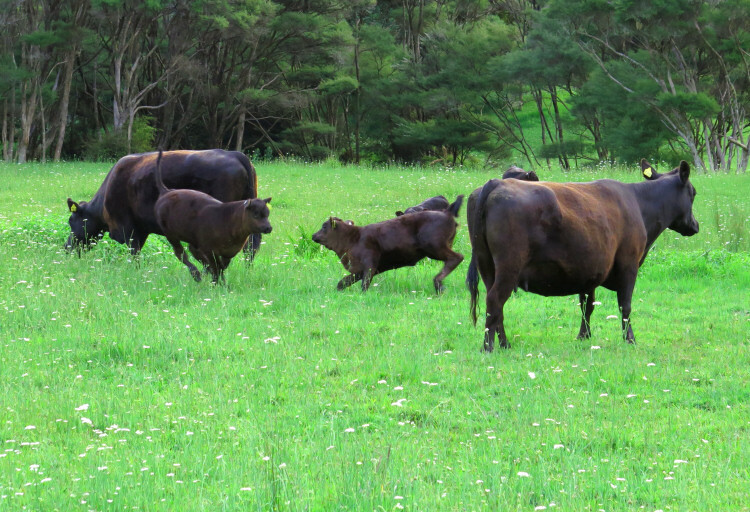 Some of the calves having a fast bit of fun in a new paddock just after they and their mothers were moved. Zella is coming on heat. We left them to it for the day. At 7.30 we drove out the gate, Stephan in Roger's ute towing the huge trailer and I in Jude's car. At about the same time, Jude, Roger, Stella, Jasper and Louie were landing in Auckland, back from their trip around the world! We arrived in Auckland at 12.30, at the house of one of Jude's friends, where they were all staying for a few days. It was such a joy to see them all again; I'm glad they're safely home. We left again at half past three in a taxi to the airport and Jane picked us up from the Kait&amacr;ia airport and brought us home. What a day. Three off to the works this morning. Dinky 94, daughter of Abigail, mother of Fancy 166. 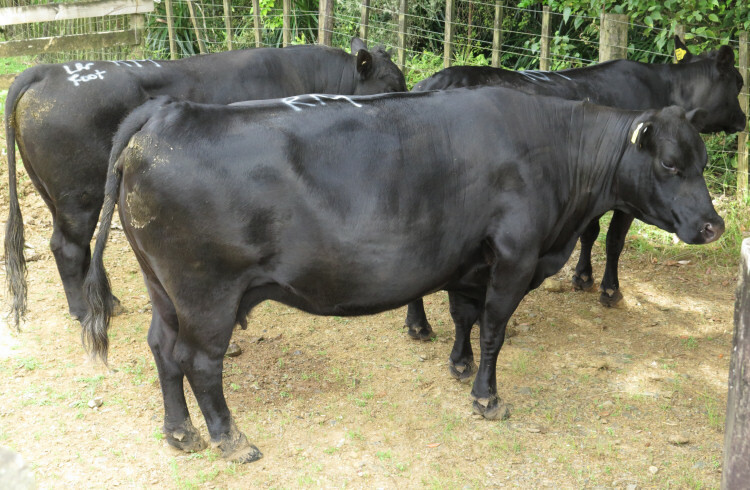 She didn't get in calf last season, despite being with one or other of the bulls throughout the mating period. 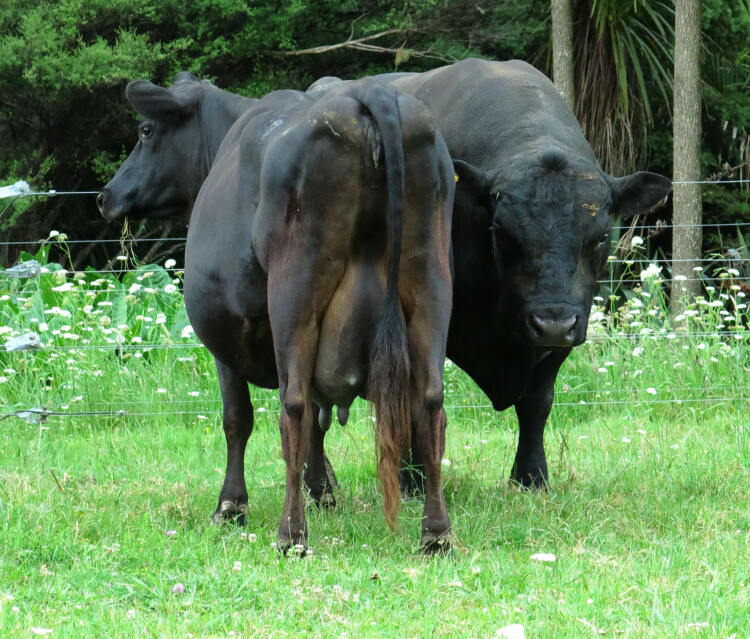 Her last two labours have been slightly odd - just wouldn't get on with having her calves without help - and her udder has become far too pendulous, so time to go. Erin 132, daughter of Demelza and an AI bull named BT Right Time 24J, whose daughters have been unsuited to this farm. Erin was on the cull list last year because of an earlier odd health event, but then no cows went to the works. 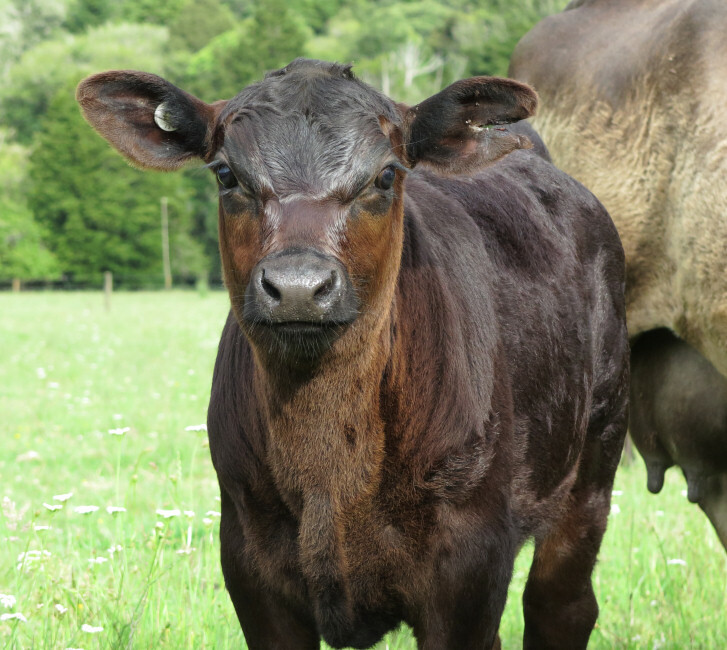 This season her calf died of a horrible seizure at two days old. 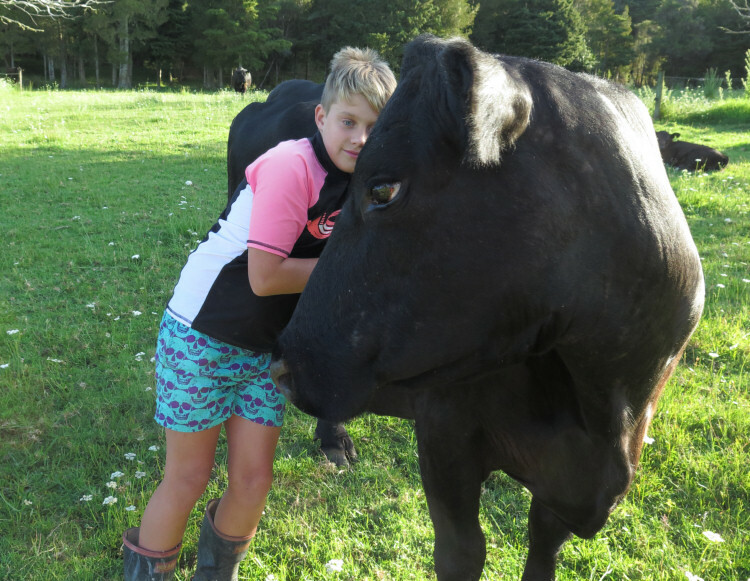 Pono 138, Dinky's son and the bull with the growth between his toes. He's going with a veterinary transport certificate primarily to alert the works vets to his presence and my vet's request for them to take a sample of the lesion for testing and identification. 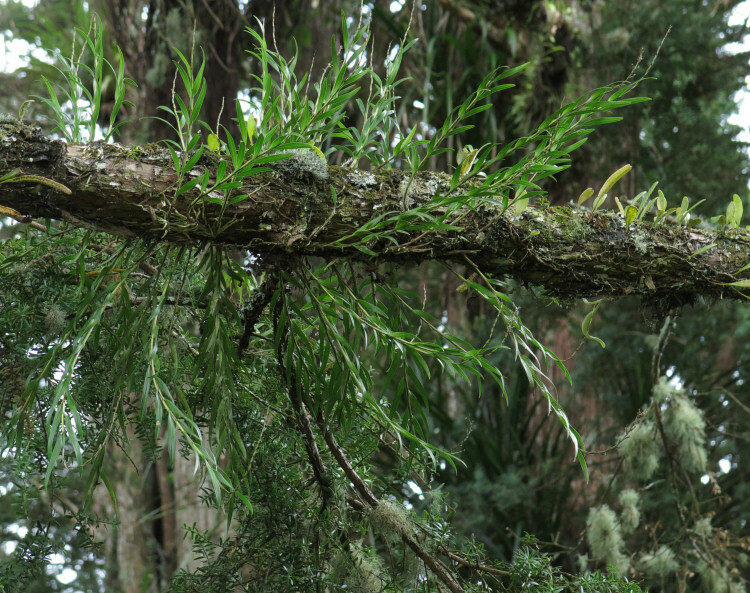 On my way away from the yards, leaving Stephan to load the cattle, I noticed these orchid plants growing on the Totara overhanging the bridge. The branch eventually fell and the orchids later flowered in my greenhouse. This is the gateway down near the bridge. The gate has always been hung from this side and it has been annoying us for ages, since some animals (particularly the calves when they're small) invariably end up caught in the corner between the gate and the fence, when we're moving them toward the yards. 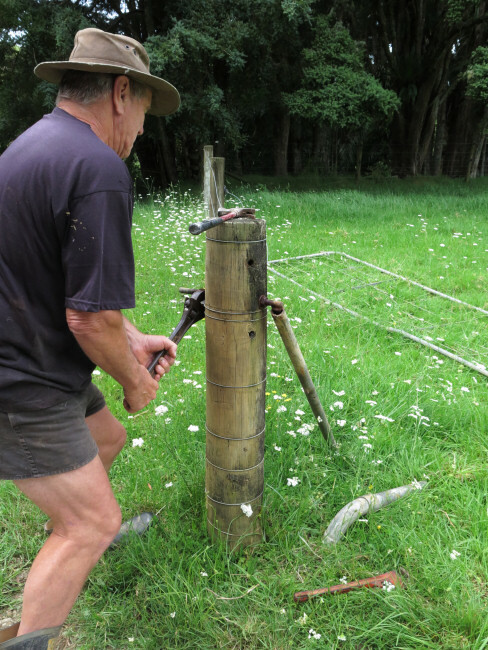 Hanging the gate from the other side will allow it to open back against that fence, creating a much better opening. 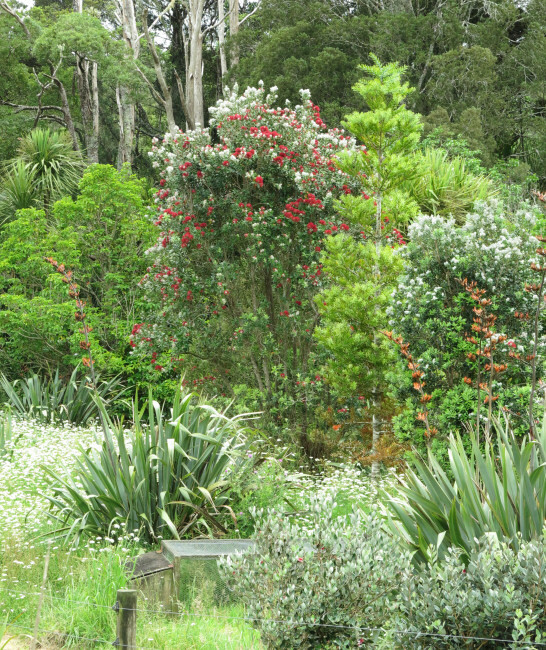 Our Pohutukawa, beginning to flower quite early this year. 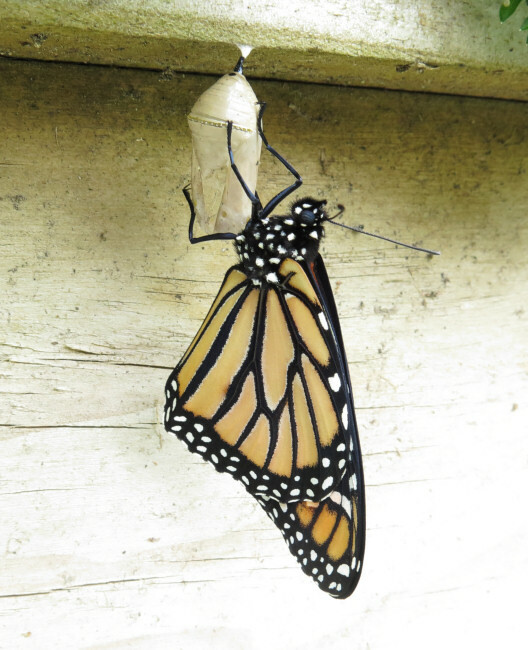 Just-hatched Monarch butterflies are so perfect. I love seeing them. Jacob's family is moving away from Diggers Valley in the morning, so he came over for a last visit. We went out so I could check the cows and he could say goodbye to Demelza, the first cow he'd stroked. 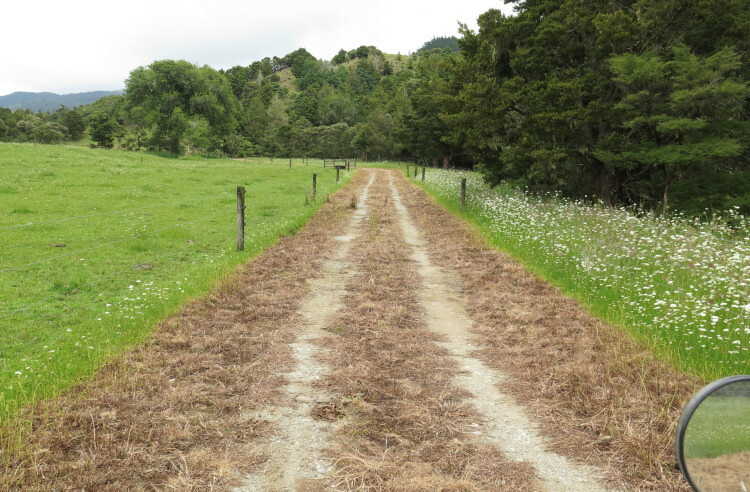 I never feel very comfortable with the need to adopt this sort of scorched earth approach to weed control but on our tracks it has become necessary, to control the weeds whose seeds come in from the quarry with the metal we spread. 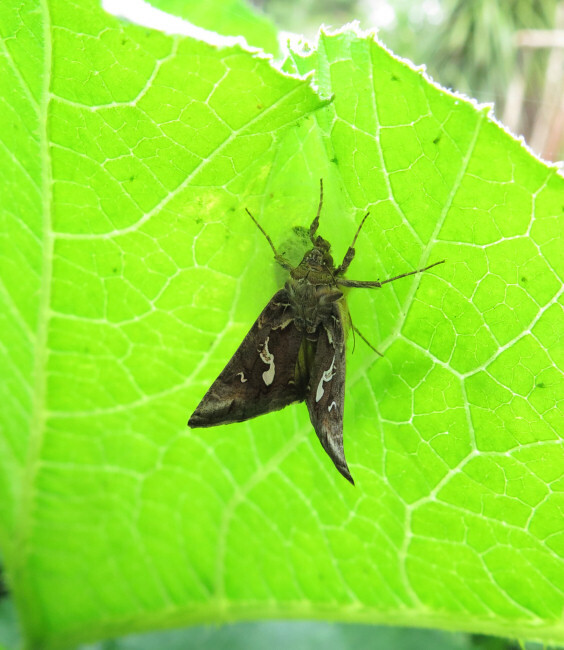 I have no idea what sort of moth this is but it has interesting markings and here I'll be able to find its picture again if I need to. The leaf is, I think, a courgette. Ouch! You'd think that would have hurt quite a bit. 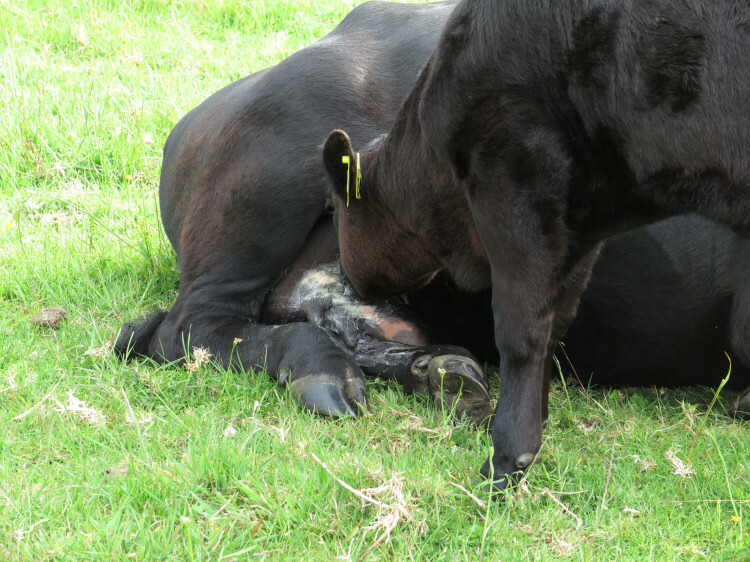 I did not notice this calf's missing tag yesterday when I moved them from Flat 2 to Flat 3. I later found it, in the middle of Flat 2, where the only way it could have been torn so violently from his ear is if someone had stood on it while he was sleeping and he woke and pulled his head up to get out of the way. He does not legally require the numbered "management tag", only the RFID NAIT tag in his other ear and as the ripped ear is an obvious difference from the others, he will remain 822, even without the visible number. There's high tea and then there's low tea. 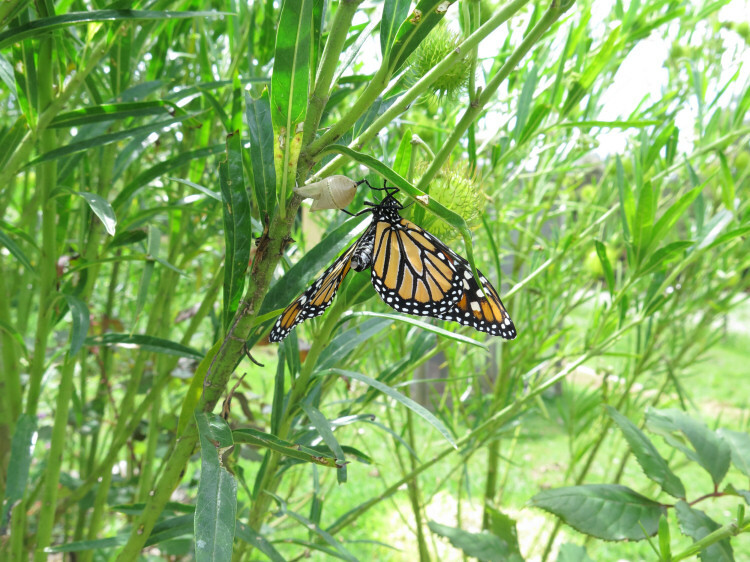 This is 824, feeding from his mother, 742. 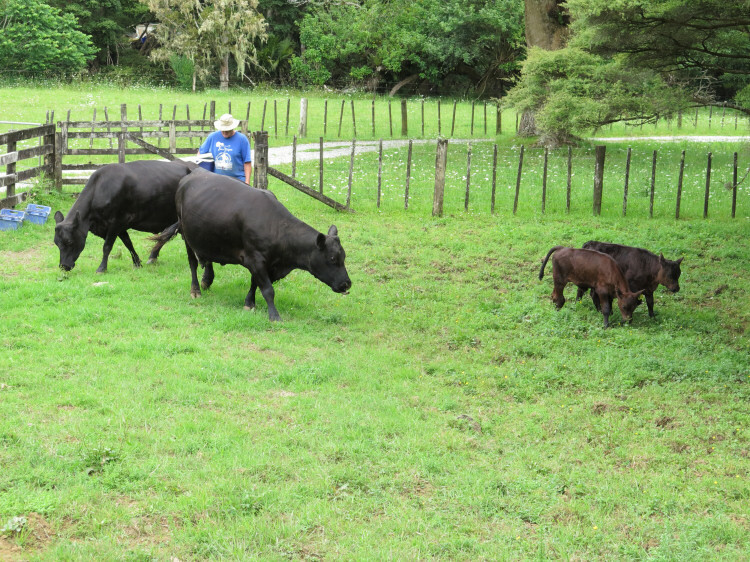 Zella, Imagen and their sons, coming in to the yards so we could 7in1 vaccinate the calves. We castrated both of them as well, with the tight rubber rings, and put their NAIT tags in their right ears. This bit of lane, from the Big Back, still grows grass because we've never put metal on it. 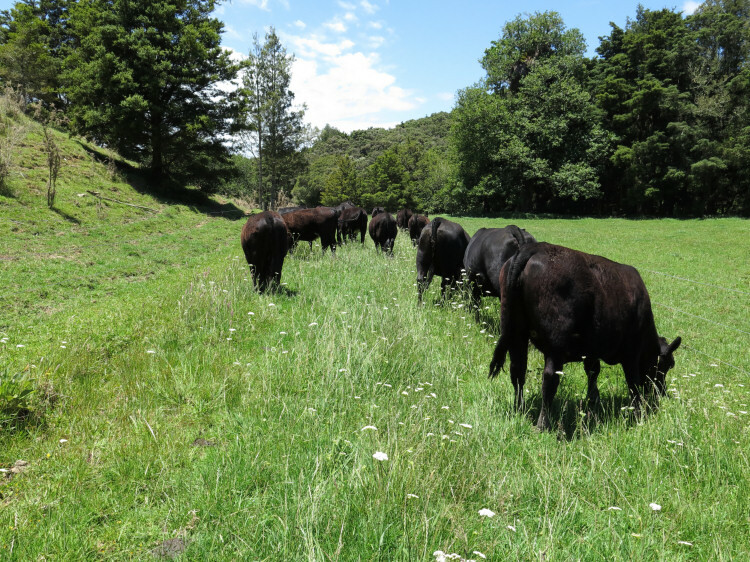 The cattle are the young mob, heading to the yards for a copper injection. 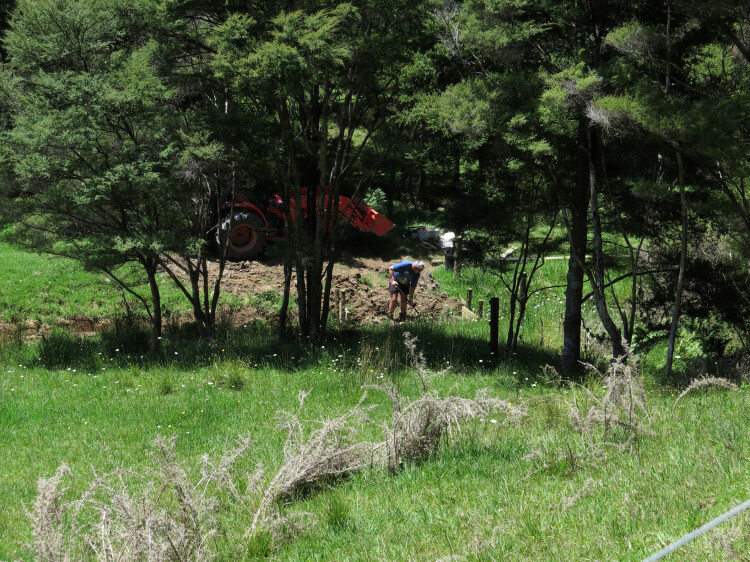 Stephan installed a culvert in the bottom end of the drain that runs down through the Blackberry paddock. A bit later I moved the second mob of cows and calves in there. 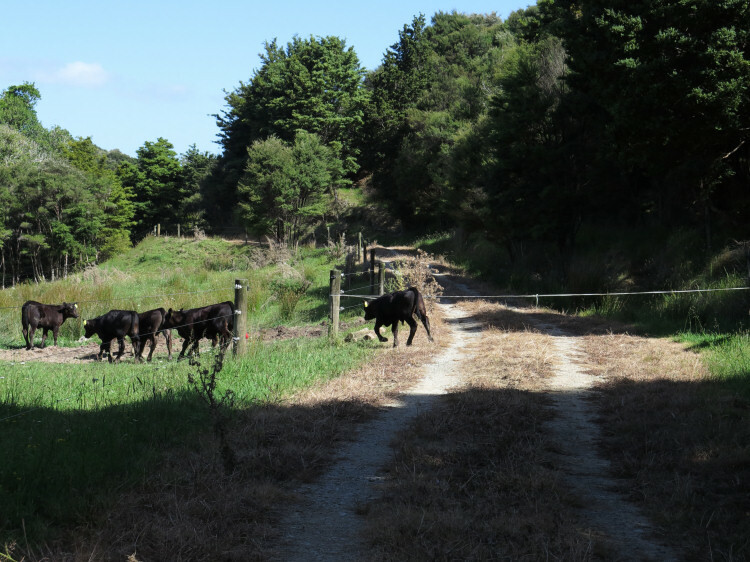 This was the moment I stopped holding my breath, as the last of the calves decided that the right way to go was through the gate, not under the tape and up the lane.